The STETIND provides ice climbers and alpinists an extra layer of protection and warmth via a waterproof and abrasion resistant integral gaiter. The gaiter is engineered from durable 3D fabric backed by fully waterproof and highly breathable Sympatex woven membrane and sealed with a water resistant YKK Zipper. Underneath is the boot upper, comprised of one-piece high tenacity breathable Termida, triple layer Thinsulate insulation and trimmed with Lorica and nylon lacing strips. The advantage of this design is the precise fit of a single boot combined with total weather protection and additional warmth. 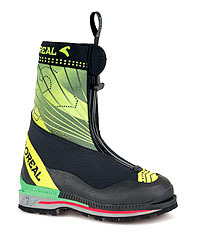 The kicker is the higher degree of breathability - to keep your feet drier and thus warmer - on ice and in the mountains. This is a difference you will feel! Additional niceties include XTP (Xtreme Thermal Protection) insole, neoprene padding, and DriLine Lining to evacuate moisture. Also notice the very positive TPU crampon attachment points -front and rear, the dual density shock absorbing EVA and PU midsole and Vibram Teton outsole. 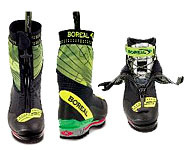 Solid climbing platform is assured by Boreal's very rigid PBG-680 - with torsion control inserts. Made in Spain. Shipped anywhere, anytime. Sizing is easy, Fit Guaranteed! FREE T-SHIRT. GUARANTEED FIT - SINCE 1980! All feet differ in size and shape (even left and right)! All shoes are built on specific forms (called lasts) providing a unique shape (curve, camber, volume & sole profile) to provide the the best performance in their category. We can help optimize your performance by confirming your boot choice (or recommending another) based decades of experience and satisfied customers.